I saw a post on Facebook from Susanna Scott of A Modern Mother and Britmums fame recently. She had posted a link to the first British Mummy Bloggers carnival in 2010. One of my posts was in it, 20:20 Hindsight which was nice. So I read it of course, a bit of memory laning for a Sunday afternoon. Before long I was immersed in my life from the early days of motherhood. I’ll say this, I was a very prolific blogger back then. How did I find the time? Goodness I can barely keep on top of my basic needs as a human these days, I manage to keep the kids fed, watered and clean and just about manage the same for myself and the cats get fed most days. Sometimes I even manage to talk to my husband in a normal, non-shouty voice and I have managed to squeeze in the entire 7 seasons of Game of Thrones. So yeah it’s not that bad. I think like most women I know it’s remarkable just how much you can fit into a life. My girls are 8 and 10. They are far from the ‘baby’ and the ‘toddler’ of the early blog days. They are fully fledged humans now. With personalities, attitudes, demands, hormonal emotions to match. Yes they are wonderful and I love them more than I can possibly say but sometimes they are bloody hard work. Aren’t yours? I mean come on. Yes we love them, yes they have spirit, yes they make each day different, yes I’m their mother and my love for them knows no bounds. But some days are just really trying and it’d be really nice not to have to repeat myself sixty gazillion times each morning. Just a single gazillion would be good. Today was one such day. I took them to school, arguing/crying all the way. The latest argument in the Ministry of Pointless Arguments was to do with the following hypothetical situation that I posed in order to distract from whatever other Pointless Argument was going on. If I had roof racks for one child and a trailer for the other, who would go where? “How about we have a little sidecar too – like a motorbike?’Me (hopeful, but realising too late that this was simply adding another dimension to the argument, always realising too late). Ok so in theory they were united in their mutual loathing of sidecars, but somehow they were both fiercely angry. With me. Great. When they aren’t tearing strips off each other, they unite in tearing me apart. Yay. The point of this long boring story is that when we got to school, the usual traffic jam of tired, pissed off, resigned-to-their-fate parents was in full swing. I tucked in behind someone to let the kids out. But they wouldn’t get out. “Please leave the car now. I’m holding up all this traffic and I’m blocking someone’s drive”. Blocking a drive is basically equivalent in Things You Just Don’t Do levels to turning up to school puffing on a Rothman’s and slurping a special brew. It’s just NOT DONE. But I did it. Then the lady who owned the drive knocked on my window. This is point where I should have calmly apologised, ushered the kids out and moved. But of course the kids wouldn’t move. They had become stuck to their seats and were not getting out. The lady didn’t even open her mouth before I did. She calmly put her hand on my arm and told me it was okay, everything was going to be okay, the kids were now getting out of the car and it would all be fine. This too shall pass. I think she actually said those words. She was sent from heaven to help me navigate my existential crisis. So yeah, it’s been a while but I’m still here, still plugging away at life and still juggling everything and occasionally dropping a few balls. 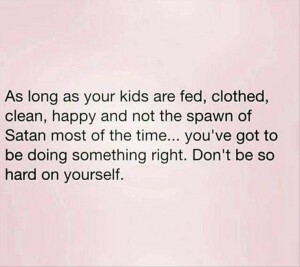 But hopefully I’m doing a passable job at mothering. I think the single biggest challenge is that nothing ever stays the same. You think you’ve got it nailed and then you haven’t. Basically it’s all fine, until it isn’t. I know if you’re reading this you will be nodding in agreement. Because no matter how much we try and do what the experts tell us we are after all human beings and we have our own unique set stuff going on in our heads and bodies. Everything we experience will be shaped by a previous experience, our frame of reference. Sometimes I’ll feel the loss of my own mother so deeply and so suddenly it’ll take my breath away. I’ll literally be 16 again. She’s lying in a hospital bed, valiantly trying to keep hanging on to life, but she can’t. And I think about that and I think that I can do all the things I need to do. Because of course I can. I’m her daughter and I’m going to keep hanging on (to my sanity mostly) or maybe I’m going to keep on doing more than that. More than merely hanging on, more like nurturing the life and the love I have. That sounds better, I like that idea.